In this series, people who claim to have experienced encounters with the spirit world tell their stories. The series features re-enactment of the purported supernatural events along with interviews with those who were involved. The series airs on the Destination America cable network. "When a nefarious spirit lashes out at a Florida man, he delves into a rash of paranormal activity from his childhood to uncover the imminent threat behind a mysterious and deadly family curse." When their daughter hears a voice in her head and begins acting strangely, the Balistreri's search for the cause. Could her behavior be related to paranormal activity in the house or is it all in her head? After a trip to a haunted plantation, Joy and her young daughters fall prey to a relentless phantom that is tied to a harrowing experience from Joy's distant past. A family's lives are at stake while they try to battle an evil entity sent to tear a young couple apart. An old spirit that tormented a woman in childhood resurfaces after many years to torment her entire family. Updated with bone-chilling bonus scenes and paranormal facts: When three siblings communicate with the family ghost using a spirit board, it's all fun and games. But they have no idea the door for good and evil spirits is now open. Updated with bone-chilling bonus scenes and paranormal facts: Shortly after losing her firefighter husband in the line of duty, Jeanette buys a fixer-upper home. But renovations reveal evidence of evil doings on the property and a restless evil. Updated with bone-chilling bonus scenes and paranormal facts: A mother and daughter both know their house is haunted. But while the mother believes it's the spirit of her murdered boyfriend, her daughter thinks it's much darker. Updated with bone-chilling bonus scenes and paranormal facts: After a beautiful teenage girl attracts the attention of an unknown presence, she becomes the target of his advances, wreaking havoc on her and her family's once idyllic lives. An old spirit that tormented a woman in childhood resurfaces after many years and encroaches on her waking hours to torment her entire family. Updated with bone-chilling bonus scenes and paranormal facts: The ghost of a tormented teen shatters the serenity of a young family shortly after they move into their first home. Updated with bone-chilling bonus scenes and paranormal facts: A family believes they have a harmless ghost in their home until it begins to threaten the children. Unwilling to let evil win, the family turns to the Catholic Church to drive the demon out. 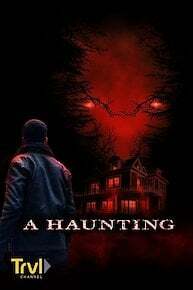 A Haunting is currently available to watch free on Destination America and stream on Discovery Channel. You can also stream, download, buy, rent A Haunting on demand at Amazon, Vudu, Travel Channel, FuboTV, Sling, FandangoNow, Google Play, iTunes online.